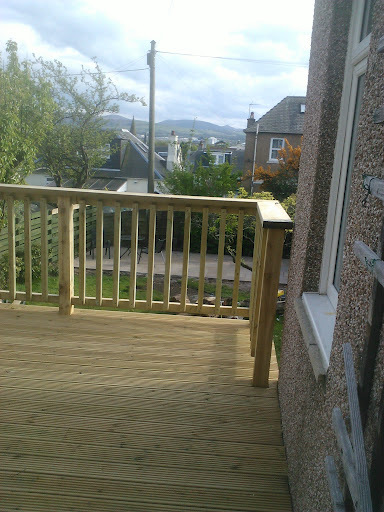 Decking Edinburgh: We offer a comprehensive range of high quality decking solutions in Edinburgh at very affordable prices. 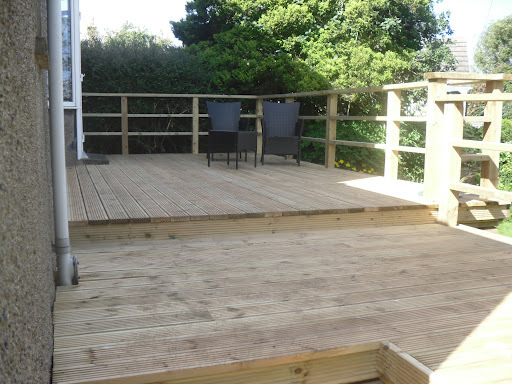 Decking is available in three types of material hardwood,softwood and composite. Hardwood is very durable and is less inclined to mark and scuff. It doesn’t need treating although if you want to keep the initial appearance it needs to be regularily oiled to prevent the timber distressing to a silvery grey. 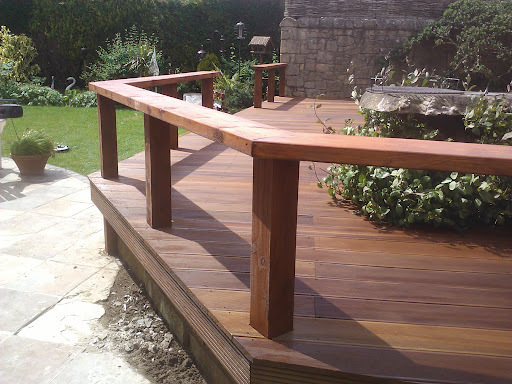 Hardwood decking is generally imported, commonly balau,teak, iroko amongst others so it is important that it is FSC sourced which means its certified and comes from sustainable sources. Softwood is the standard choice for decking in the uk as it combines affordability, durability and looks. 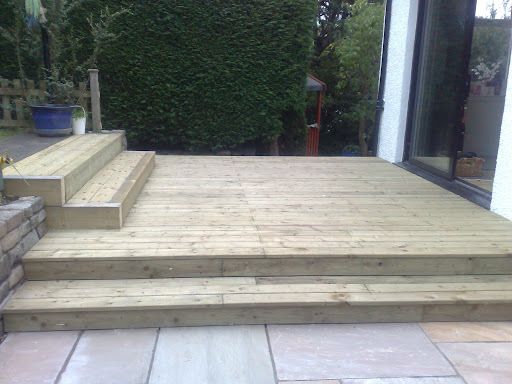 The timber is pressure treated to extend the life of the decking,which should last up to 30 years. 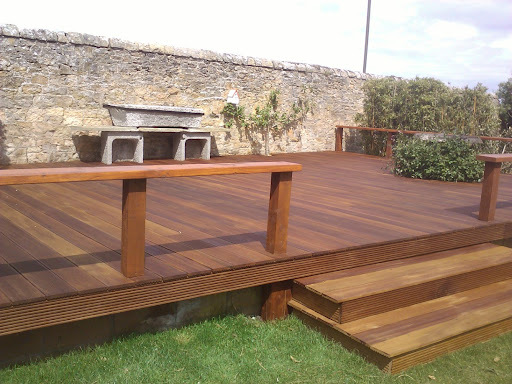 The boards we use are redwood pine which are superior in durability to native whitewood decking. All timber is FSC sourced. Composite decking unlike timber resists fading, weathering and rot as it is made from a blend of plastics. It is maintenance free and comes in a variety of colours. Softwood decking is the most popular choice for customers as it is both durable and economical and requires minimal maintenance. Hardwood decking is the most pleasing looking and is highly durable but requires higher maintenance to maintain aesthetics and is more expensive than softwood. 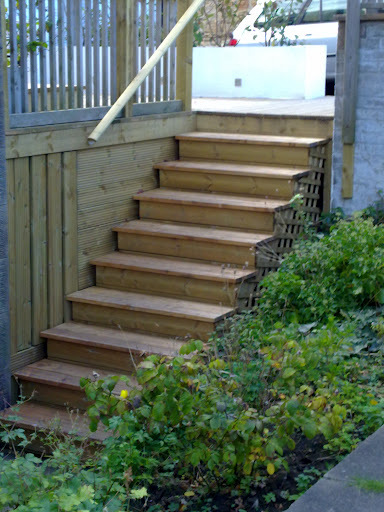 Composite decking requires no maintenance but is more expensive than softwood and is artificial. 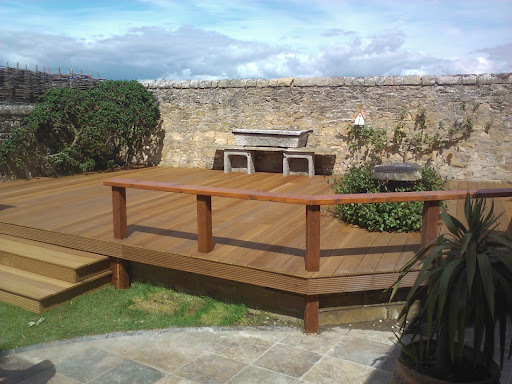 Deckboards are generally 145mm wide with a 5mm spacing , 30mm deep and 4800mm long. They are normally reversible being grooved on one side and smooth on the other side. 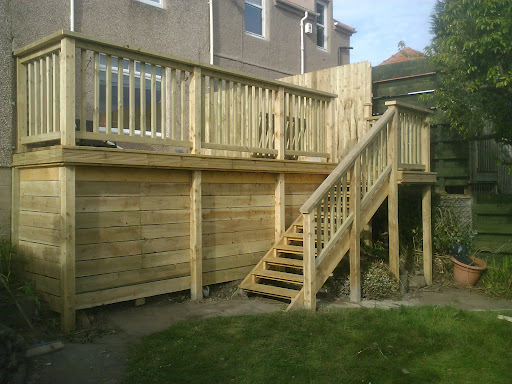 Here is a split level deck that we built for a client in Edinburgh. Its made from redwood pine. Originally there was a an overgrown rockery with an old concrete path. The deck has covered all this over and now the are is easily accessed by the patio doors creating a nice inviting area to the garden. 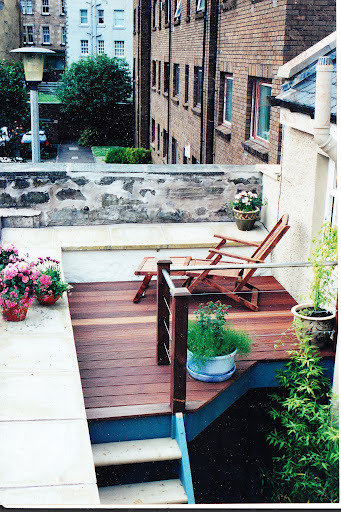 Here is a high level decking that we built in Edinburgh for a client near the Pleasance. She only had a small courtyard that had very little light as it was bounded by a wall that came up to her bedroom window, just visible middle right. So we built the deck to the wall height. If you look at the windows of the flats you can get a feel for the height. We had to build a staircase up to the deck, 14 steps I think. the deck itself is hardwood, yellow balau. The balustrade was made from stainless steel wire and tubular steel handrail. We paved the courtyard and fitted a water feature and put some specimen planting in like the bamboo visible to bottom right of deck. 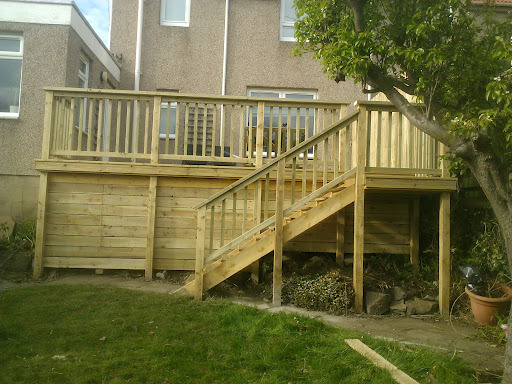 Here is a picture of a split level softwood deck . 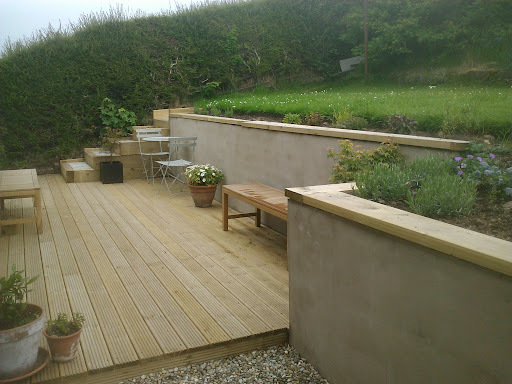 The upper area is cut on a radius and the balustrade is formed from timber uprights with a hemp rope baluster. 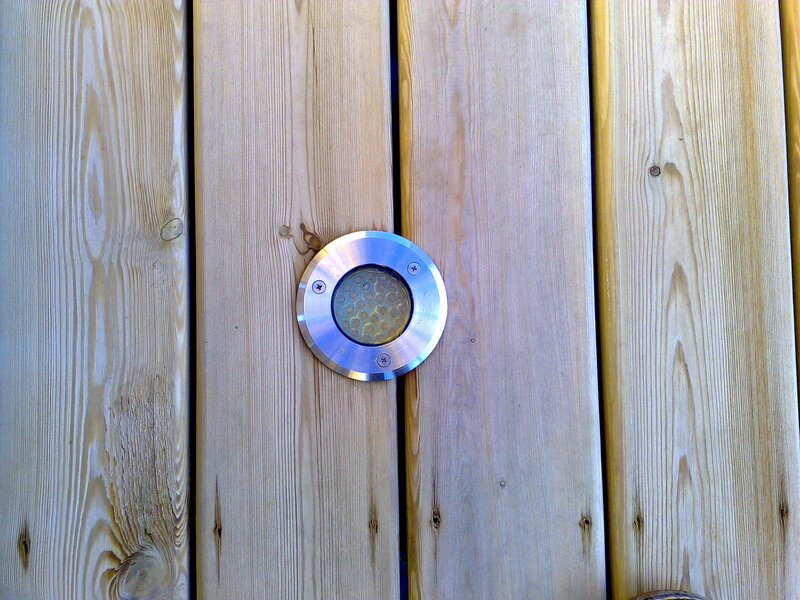 Note the inset lighting to the right of decking step. 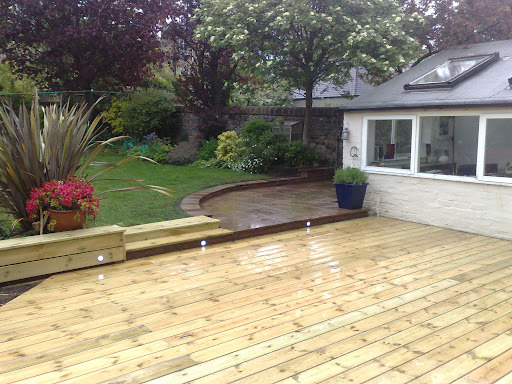 This decking Edinburgh design is formed from tanalised redwood pine deck boards. The boards are 145mm wide and 37mm thick with a 5mm spacing and are secured with 75mm long screws. The boards sit on the underbuild which consists of 150mm x 50mm joists @ 500mm centres. this was a particularily large deck approx. 90 sq. m. and can actually be viewed on google satellite maps!! There was also associated Edinburgh landscaping to the right where we formed steps from hardwood timber sleepers and laid a lawn. 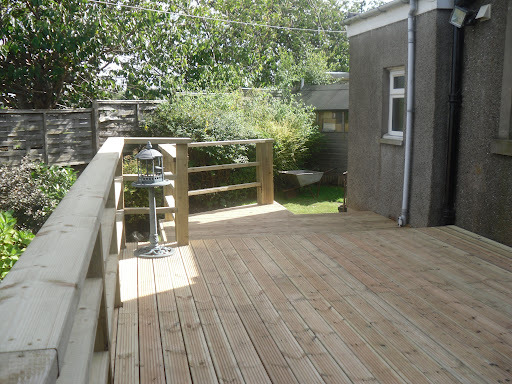 chevron fence panels were fitted to the rear of the deck to give privacy. Here are two types of balustrade for a timber deck from Garden Construction Co. The top one for a low level deck doubles as informal seating and is nicely understated to complement the modern style of the deck. The lower picture shows decking Edinburgh and a standard balustrade specified to building standard being 1100mm high with 100mm spacings to balusters. At 1.8 m high it is essential that the decking balustrade conforms to these standards. The top one,s before and the bottom one,s after, just in case you were wondering. 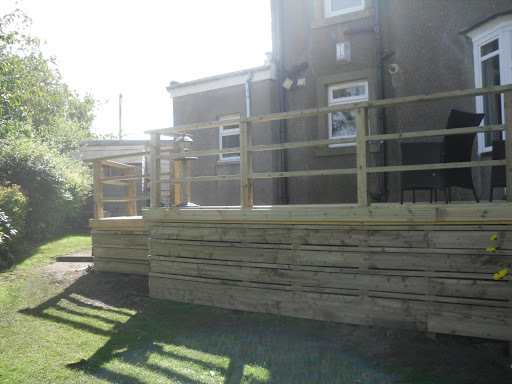 Here is a soft wood deck that we built for Rachel who lives in Edinburgh at the back of Arthurs Seat. We had to manually excavate the decking area as there was no access for a digger. The ground level was the height of the wall before we dug it out. 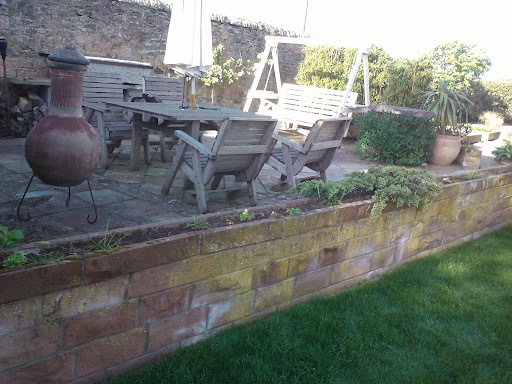 So once we had excavated the area, we built the retaining wall , concrete block cement rendered. 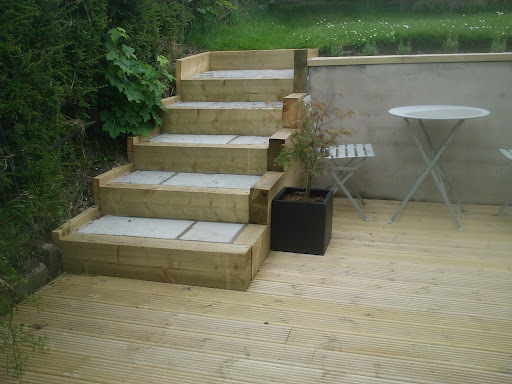 Then we installed the deck and finished off with timber sleeper steps with stone paving inlays to upper terrace. 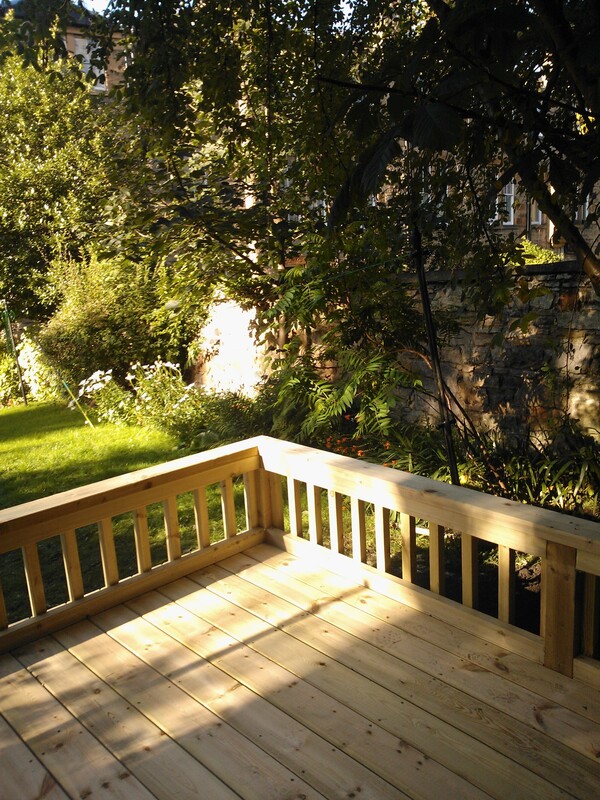 Here is a gorgeous deck by Garden Construction Co in Edinburgh for a client in the Polwarth area of Edinburgh . This is a hardwood deck hence the darker colour from standard pine. We also installed a pond for the customer with a waterfall as complementary landscaping to the whole scheme resulting in another happy customer. 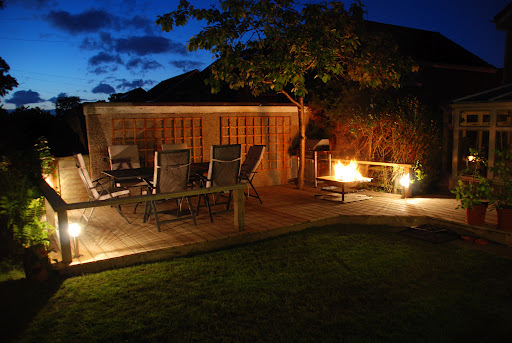 here,s another decking edinburgh picture, this time its at night and accessorised with lighting and a fire pit.This is a low level timber deck constructed from softwood. There was an existing tree in the designated area so we incorporated it into the deck. Note the low balustrade that doubles as a bench. We sourced the lighting from B&Q diy.com the firepit and furniture from Dobbies dobbies.com. 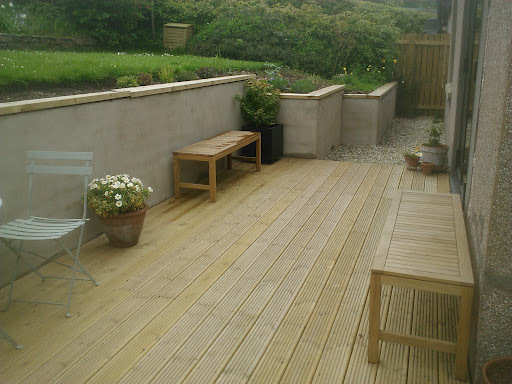 Here,s another deck that the Garden Construction Co have just completed in Edinburgh. 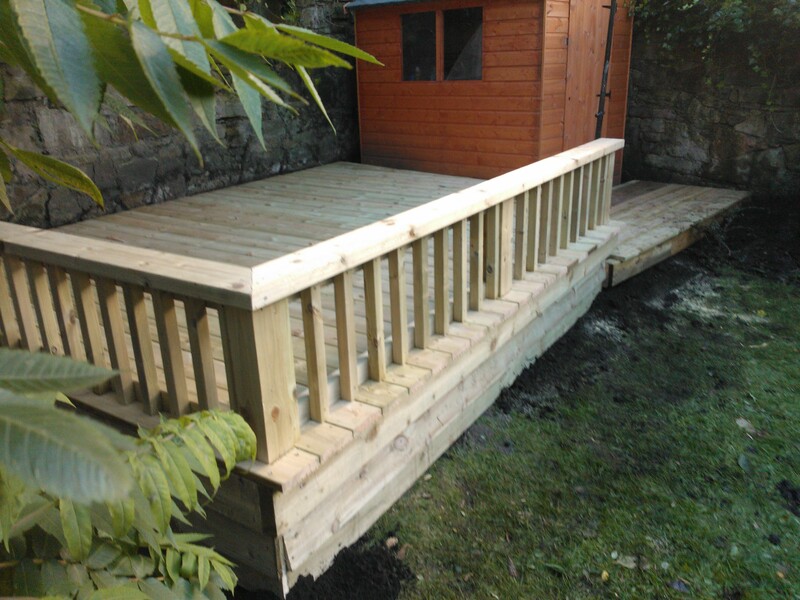 This one is a raised deck 1.8m high constructed from softwood pine that has been treated ( tanalised) to prevent rot. 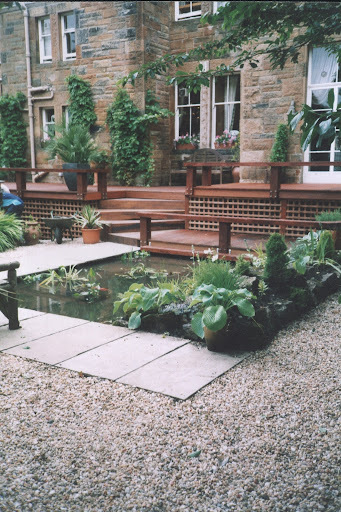 Decking ,The Grange, Edinburgh. Before and After.